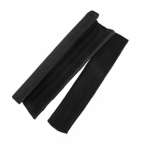 These black neoprene covers add cushioning and comfort to our poly rope cow halters. They help protect animal's nose from chafing and hair loss. Hook and loop closures provide easy on and off. Measure 8" long. Sold in pack of two.